The river god Achelous is hosting a banquet, his guests being Theseus, Ixion’s son, Lelex, and others. Once Achelous has told the story of the nymphs who were turned into the Echinades, Lelex starts telling the next, of Philemon (the husband) and Baucis (his wife). This is one of Ovid’s most touching myths, which doesn’t appear in any other source. Ixion’s son claims that Achelous made the gods appear too great. Lelex therefore tells his story to prove that whatever the gods will to happen will take place. He says that, in Phrygia (now west central Anatolia, in Turkey), there is a place where an oak and a lime tree grow side by side. Near there is a marsh, where once the land was habitable. Lelex’s story explains how those came to be. One day, Jupiter and his son Mercury were walking on the earth, and were in Phrygia. When they grew tired and wanted to rest, they tried a thousand homes, but every one rejected the visitors, until they came to a poor thatched cottage. There they met the elderly Philemon and Baucis, who had married in their youth, and lived good and pious lives together ever since. The couple welcomed the gods into their tiny and humble home. Philemon and Baucis waited on their guests’ every needs, lighting a fire, providing them with warm water to bathe their feet, then serving them food and wine; the latter was strange, because as fast as they could pour wine into their guests’ beechwood goblets, the pitcher of wine refilled. They tried to catch the goose which guarded their cottage, to kill and cook it for their guests, but it ran to the safety of a guest’s lap. The gods then revealed their divinity, and told their hosts that those who had shunned them would pay for their wickedness, but the old couple would be spared. Jupiter and Mercury then took them outside, and led them up the nearby mountain. When close to the top, Philemon and Baucis looked back to see all the land below was flooded, except for their tiny cottage, which had been transformed into a temple, with a roof of gold. new leaves and branches covered both at once. the branches of the hallowed double-tree. I said, ‘Those whom the Gods care for are Gods! So they were transformed into an intertwining pair of trees, one an oak, the other a lime (linden). Relatively few artists have tried to paint this delightful story, even though it might seem amenable to a Christian twist. However, it has attracted the attention of some of the greatest masters of narrative painting. If you wish to see a more comprehensive collection of paintings of this myth, see my earlier article. 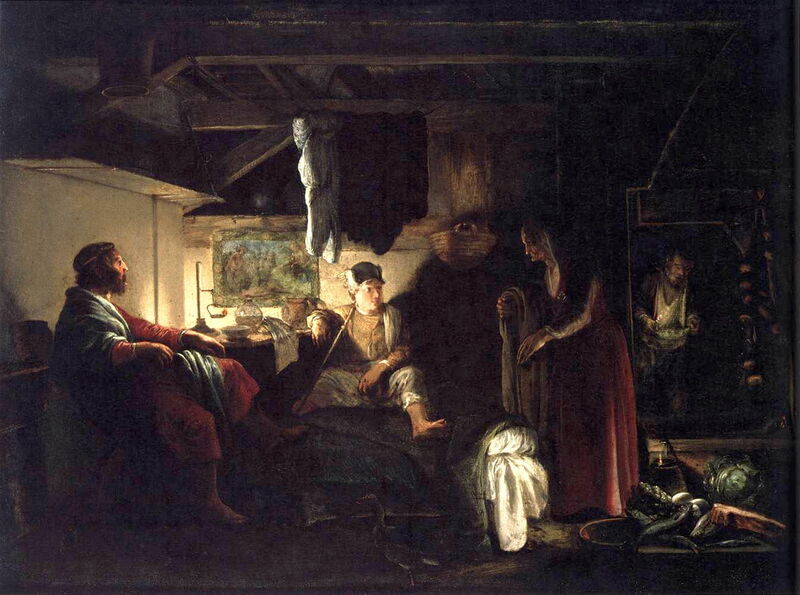 Adam Elsheimer’s exquisite oil on copper painting of Jupiter and Mercury with Philemon and Baucis (1609-10) shows Philemon (right) and Baucis (centre right) giving their hospitality generously to Jupiter (left) and Mercury (centre left), in their tiny, dark cottage. All four are depicted in more contemporary dress, although Mercury’s winged helmet is an unmistakeable clue as to his identity. David Rijckaert’s undated painting of Philemon and Baucis Giving Hospitality to Jupiter and Mercury provides the basis of what has become the most popular depiction: Mercury (left) and Jupiter (left of centre) seated at the table, with Philemon (behind table) and Baucis (centre) waiting on their every need, ensuring that they eat and drink their fill. Baucis has almost caught the evasive goose, and an additional person is shown in the background preparing and serving food for the gods. Rijckaert adds some subtle details such as Jupiter’s eagle perched in the rafters. 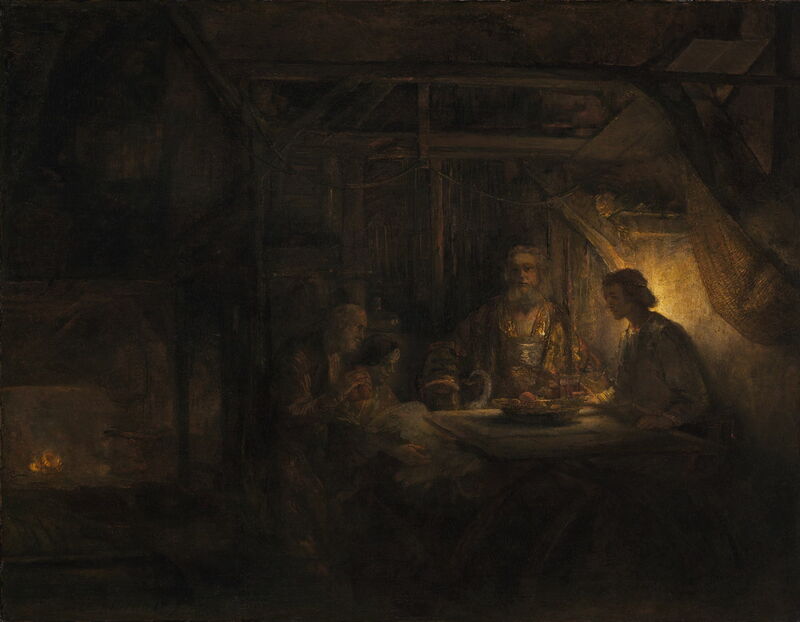 Rembrandt’s Baucis and Philemon (1658) is one of his late works, and shows Jupiter (looking decidedly Christlike) and Mercury (the younger, almost juvenile, figure) sat at the table of a very dark and rough cottage, lit by a lamp behind Mercury. This dramatic lighting is precursor to similar effects in his later Ahasuerus and Haman (1660) and Conspiracy of the Batavians (1661-2), shown and discussed here. Although Rembrandt created many wonderfully narrative paintings, he seldom showed stories from Ovid’s Metamorphoses. He has made the painting using rough brushstrokes and highly gestural marks of paint, as roughly hewn as the cottage which it depicts. It is not just an outstanding account of this myth, but one of his finest narrative paintings. 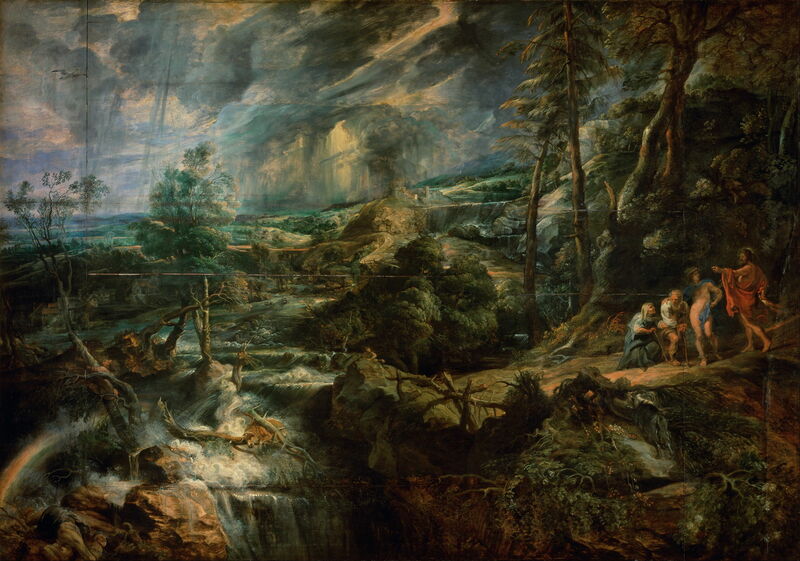 Rubens’ Stormy Landscape with Philemon and Baucis (c 1625?) 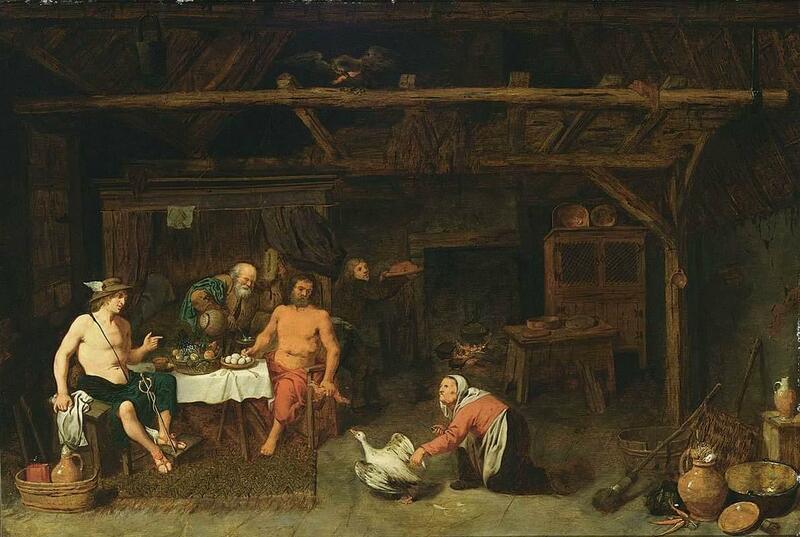 is one of the few paintings to show a broader view of a later moment in Ovid’s story. His dramatic landscape shows stormclouds building over the hills, a raging torrent pouring down the mountainside, dragging large trees and animals in its swollen waters, and the four figures on a track at the right. Philemon and Baucis are struggling up the track with their sticks, Jupiter points to a rainbow formed over a waterfall at the lower left corner, and Mercury is all but naked. These are four superb narrative paintings which do one of Ovid’s best and most human stories justice. Even so, one stands out for me as being one of my favourite paintings out of the whole of this series so far: Rembrandt’s. It seems such a shame that he painted myths from Metamorphoses so infrequently. Posted in General, Language, Life, Painting and tagged Elsheimer, Metamorphoses, myth, narrative, Ovid, painting, Rembrandt, Rijckaert, Rubens. Bookmark the permalink.